Do you have windows that face outward toward a view that you would rather not see? Perhaps it is the view of the house next door or a bare wall, or maybe you need some protection from the sun. To solve this problem, have you ever considered using plants in place of curtains? In my garden, I have east-facing windows, which heat the house early in the day. When our home was being built, I designed the landscape so that there were plants placed in front of those windows. Why would I put plants in front of these windows you may wonder? Well, I needed some sort of shelter from the sun, but I didn’t want curtains that would block my view of the garden, so I chose to add Mexican bird-of-paradise. This yellow-flowering shrub can be pruned into a small tree, which is what I have done, which still allows me to view the garden beyond while providing some protection from the sun’s rays. A few years ago, I was working with a client who was an interior designer who had employed this same strategy for adding beauty while shielding her windows from the sun. She had decided that instead of curtains for her windows, she wanted ‘natural, green’ window coverings. This is the view from her living room where the lush green foliage from the ‘Orange Jubilee’ create interesting shadows inside and she can enjoy the feeling of being surrounded by beautiful plants, even while indoors. To achieve this, she planted a row of ‘Orange Jubilee’ (Tecoma x ‘Orange Jubilee’) shrubs in front of her windows. Here is another example of using plants in place of curtains. A single hop bush shrub creates a lovely green screen that protects this west-facing window from the blistering afternoon sun. Have you ever tried using plants instead of curtains? Sometimes, one area that many homeowners struggle with is what to plant in their side yards. It can be an awkward place with little sun and not much room for plants to grow. Most of these narrow spaces along the side of our home are little more than “yards,” but there is potential to turn them into “gardens.” On a visit to a client’s house, I saw a great example of this, where the homeowner had created side gardens. First, her first side garden was planted with upright Bougainvillea shrubs against the wall with Star jasmine (Trachelospermum jasminoides) planted in between. I liked the symmetry of the alternating plants and how they covered the wall so well – I’m not a fan of a view of a bare wall outside my window. Most of the time the star jasmine produces small white fragrant flowers in spring, and the bougainvillea produces vibrant blooms spring through fall. Also it’s neat about this plant combination is that the base of the wall in a narrow side garden rarely gets much sun, and star jasmine does well in the shade. After all, bougainvillea does best in sunny spots, and the top part of them gets just enough sun to promote blooms. In the other side of the garden, Yellow oleander (Thevetia peruviana) trees grew along the wall toward the back and ‘Orange Jubilee’ (Tecoma x ‘Orange Jubilee’) shrubs covered the wall closer up creating a lush green backdrop. I did make two suggestions in regards to this side garden. Remove the ‘Orange Jubilee’ shrubs growing in-between the yellow oleander trees. Right now, they make that area look overcrowded, and you cannot see the beauty and symmetry of the tree trunks against the wall. Also, If you never see your side garden or it serves as your utility area, understandably, you may not want to spend time and money on adding plants. However, I do recommend focusing on placing plants directly across from any windows that face into that area, because who wants to look out onto a bare wall? What do you have growing in your side garden? Is your outdoor space looking rather drab? If so, you aren’t alone – many landscapes can appear somewhat dull, especially if there is a lack of color. But, it doesn’t have to stay that way. One of my favorite aspects of my job as a landscape consultant is to help my clients to transform their garden from drab to colorful and it is quite easy to do. I invite you to join me as I revisit with a client two-years after I created a planting plan for her existing, lackluster landscape. Initially, this area did little to add to the curb appeal of the home. Overgrown red yucca plants and a cholla cactus created a ‘messy’ and boring look to this high-profile spot in the landscape. Removing the old plants and adding angelita daisy (Tetraneuris acaulis) and gopher plant (Euphorbia biglandulosa), creates colorful interest while adding texture. Before, the boulders were hidden behind the overgrown plants, so now they serve as an excellent backdrop for the new additions. The corners of the driveway are one of the most viewed spots in the landscape and are often the first part people see when they drive by. It’s important to anchor them visually with plants that look great all year and preferably produce colorful flowers or have an attractive shape or color. I always like to add boulders to help anchor both corners as well. These areas are also critical in that they create symmetry, connecting both sides of the landscape, which is done by using the same types of plants on each side. Although there is no ‘before’ photo for the entry, here is an example of plants that will add year-round color because of their overlapping bloom seasons. ‘Blue Elf’ aloe blooms in winter and on into early spring while ‘New Gold Mound’ lantana will flower spring through fall, as the aloe fades into the background. A ponytail palm (Beaucarnea recurvata) brings a nice vertical element to this spot and will grow taller with age. Along the front entry path, a tall cereus (Cereus peruvianus) cactus adds a welcome vertical element while the golden barrel cactus (Echinocactus grusonii) creates excellent texture contrast. However, something is missing in this area, in my opinion. A colorful element was what was missing in this area. A single firecracker penstemon (Penstemon eatonii) adds beauty while also attracting hummingbirds. On the corner of this lot was a palo brea tree with a large desert spoon and turpentine bushes. Overall, there was nothing exciting in this spot. The turpentine bushes were removed to make way for a set of gopher plants, which served to tie in this corner of the garden with the areas next to the driveway. These succulents flower in spring and add nice spiky texture throughout the rest of the year. Purple and white trailing lantana (Lantana montevidensis) serve to create a colorful carpet throughout the warm months of the year. This type of lantana can struggle in full sun in the middle of summer in the low-desert garden but, thrive underneath the filtered shade of a palo verde tree. When working with an existing landscape, I relish the challenge of determining what existing plants still add beauty to the outdoor space, or have the potential to if pruned correctly. Sometimes an ugly, overgrown shrub can be transformed into something beautiful if pruned back severely. Often, it’s up to me to decide what goes and what stays. Then, the real fun part begins, which is selecting what areas need new plants and what ones will work best. I find that many people think that to renovate a landscape, you need to get rid of most of the plants and put in a lot of new ones. But, this is rarely the case. All you need to do is keep the plants that will continue to add to the curb appeal or create a beautiful, mature backdrop for new plants and new plants should be concentrated in high-profile areas where their impact will be maximized. What would you like to get rid of in your landscape and what would you keep? As the garden begins to awaken in spring, our thoughts turn to getting our plants ready for the growing season, which often involves pruning. There are different types of pruning, each of which, are used to accomplish particular results, ultimately keeping your plants attractive and healthy. If you are learning how to prune your trees and shrubs yourself, it’s especially important to learn about the various ways of pruning to help you determine which way(s) are the best to employ. To do this, let’s talk about the definitions for common pruning terms so you can choose the right method for your trees and shrubs. I break it all down for you in my latest article for Houzz. How would like gorgeous red, tubular flowers blooming at Christmas time and lasting past Valentine’s Day, all packaged up in an attractive, low-maintenance shrub? Believe it or not, such a shrub exists. Let me introduce you to ‘Valentine Bush‘ (Eremophila maculata ‘Valentine’). 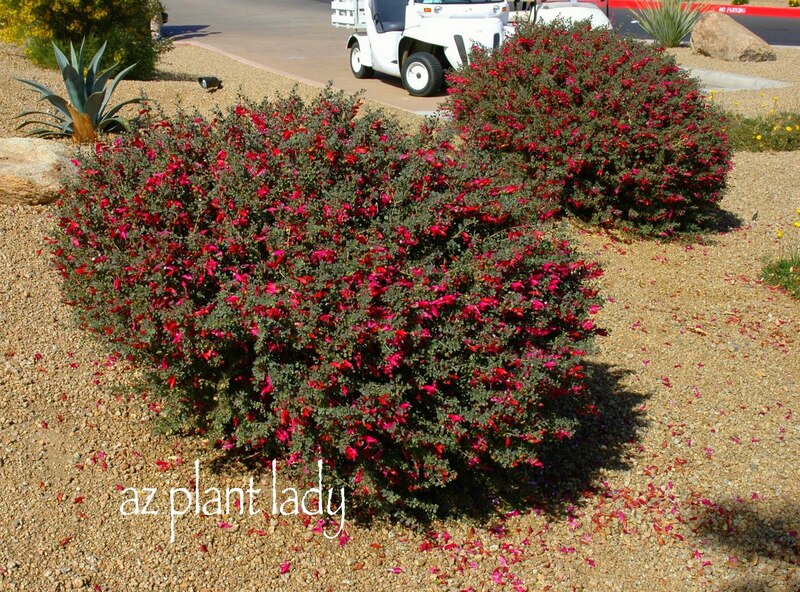 My first experience with this colorful shrub occurred in 2000 when I was offered two free Valentine shrubs to test out on the golf course where I was working. Never one to pass up free plants, I was more than happy to try these new shrubs out. Young Valentine, six months after planting, next to Trailing Rosemary. Those new shrubs did so well that a couple of years later, I had planted over fifty of them planted all around the golf course. I love their cool-season blooms, which add a welcome splash of color when many plants aren’t blooming, and the dark green foliage continues to add beauty to the landscape even when their flowers fade. Nowadays, you will find Valentine in both commercial and residential landscapes. An interesting fact that many may not know is that many of the arid-adapted plants that thrive here are native to Australia, including the species Eremophila. 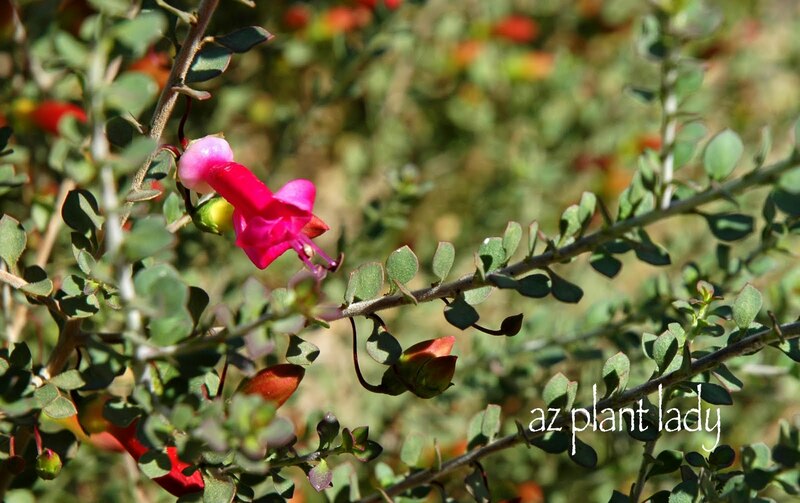 USES: Valentine provides much need color in the landscape during the winter months and will bloom through early spring. 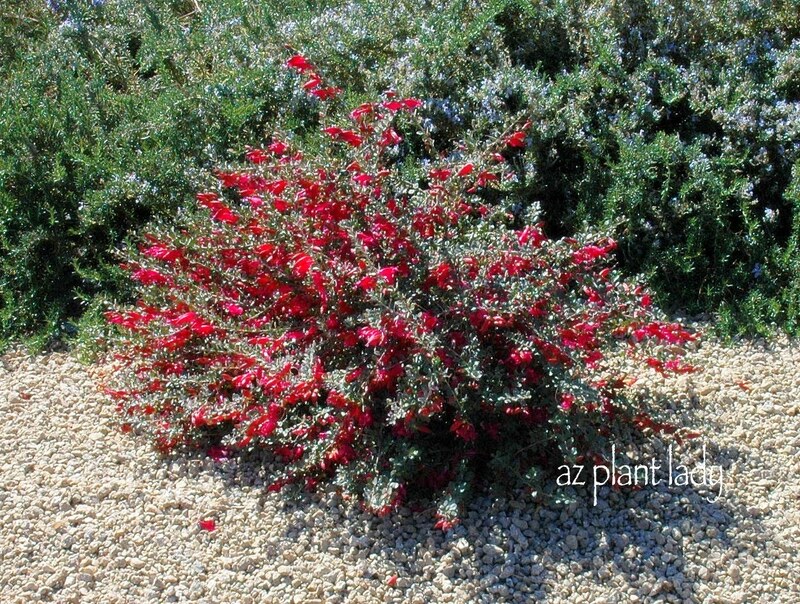 Red is often a color missing in the desert plant color palette which this shrub provides. Valentine grows at a moderate rate and will reach a mature size of 3-4 feet high and 4 feet wide. I pair it with groundcovers such as blackfoot daisy (Melampodium leucanthum) or trailing rosemary (Rosmarinus officinalis), and perennials such as Parry’s penstemon (Penstemon parryi) and desert marigold (Baileya multiradiata). Valentine when not in flower. When not in flower, Valentine is still very attractive and is hardy to 15 degrees F. It does best when planted in full and reflected the sun. Their leaves turn maroon at the tips during the winter adding some fall color to the landscape. MAINTENANCE: Valentine does best with regular irrigation and soils with good drainage. If planted in areas with wetter soils, let the soil dry out between watering to prevent root rot. 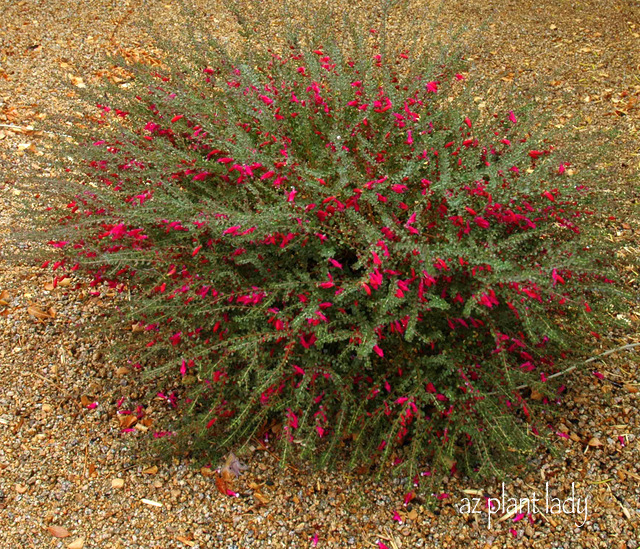 You will probably not believe this, especially coming from me – the person who rants and raves about beautiful shrubs that have been incorrectly pruned by being sheared, but here it is: Valentine shrubs should be sheared. That’s right, I said they should be sheared. Believe it or not, there are some types of shrubs where shearing is the best way to prune them, and this is true for Valentine. They should be pruned ONCE a year, once they have finished blooming in the spring. DO NOT prune later in the year as this will remove the branches that will produce the flowers later in the year. Here is the first bloom of this season on my Valentine shrub. Well, would any of you be surprised to know that Valentine is my favorite shrub? I mean, what is there not to love? It has everything – low-maintenance, attractive foliage, thrives in the heat and sun and most importantly, gorgeous winter color. In this landscape area, I designed, you can see Valentine in the background paired with Parry’s Penstemon and Desert Marigold. So run, don’t walk, and go and add Valentine to your landscape. 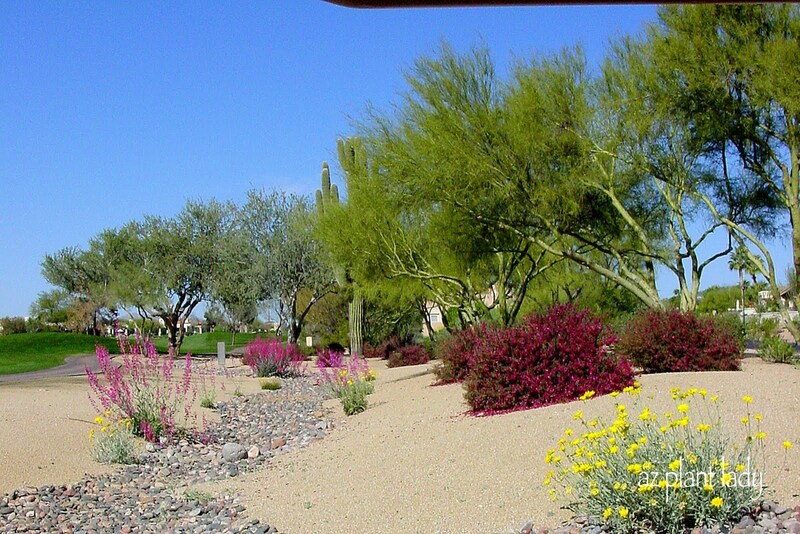 Living in the desert southwest has many advantages, including being able to have a landscape filled with blooming plants all winter long when gardens throughout much of the country are brown or covered in a layer of snow. Over the weekend, I stepped out into my garden to see how my plants were doing and took photos of those that were flowering. **I’ve provided links to earlier blog posts where you can learn more about these plants and see if they deserve a home in your landscape. First, were the globe mallow, which are just beginning to produce their colorful blooms. While the most common type produces orange flowers, they do come in other colors as well. I have red, pink, and white ones in my garden. You can learn more about this plant in an earlier blog post. Despite its small size, angelita daisy is a small powerhouse in the landscape that blooms off and on all year long. They thrive in full sun and look great when grouped next to boulders. During my walk through the garden, I discovered that this one has a volunteer Parry’s penstemon (Penstemon parryi) growing next to it. I’ll leave it alone as they will look great together. This perennial delights hummingbirds with its red-orange blooms that appear in January and last well into spring. There are many different kinds of penstemon, which thrive in drought-tolerant gardens and firecracker penstemon is by far, my favorite. The delicate flowers of this ground cover don’t look like they can survive the intense heat of the desert garden, but blackfoot daisy thrives all year long with little fuss. I have mine growing alongside boulders and at the base of cactuses. I haven’t been able to determine exactly when they are supposed to bloom because mine always seem to be flowering. This groundcover form of lantana is a popular staple in the drought-tolerant landscape, but you seldom see it with two different colors. In winter, it is usually touched by some frost damage, but our weather has been unusually warm, so it is still flowering. Normally, you see all white or all purple, but not both together. While there is a variety called ‘Lavender Swirl’; it can be hard to find and somewhat expensive. I’ve replicated the same look in my garden, which I share in this earlier blog post. Here is the newest addition to the front garden. It shouldn’t be blooming this time of year, but again, with the mild winter, it is getting a head start on spring. ‘Sparky’ tecoma is a new plant that is a cross between yellow bells and orange bells. The flowers are apricot in color with deep maroon centers. 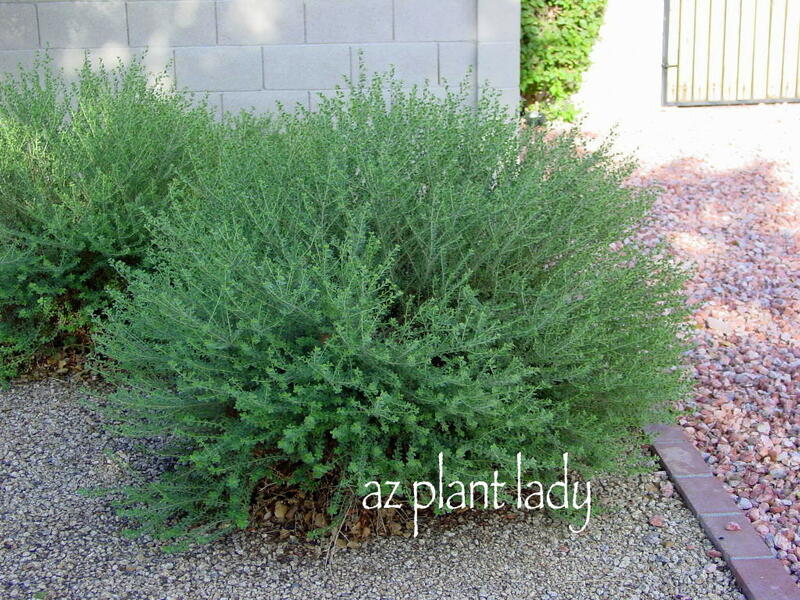 This shrub was created by an ASU professor, who named it after the school’s mascot. I am very excited to see it reveal its lovely flowers on either side of our large front window. Do you have any plants that bloom in winter? Inside or outside, please share what is happening in your garden this month. The holiday season is a time where I try to balance out the preparations for Christmas with time to sit back and enjoy the particular elements that only occur this time of year. On that note, I’m happy to report that I’ve finished shopping for gifts, which are all neatly wrapped underneath the tree or on their way to recipients who live far away. I must admit that I have never finished this early before and it is a bit disconcerting as I keep feeling as if I’m forgetting something important. Last weekend, my mother treated us to an outing to The Nutcracker, by Ballet Arizona and the Phoenix Symphony Orchestra. We arrived a bit early, which gave us the perfect excuse to walk through the downtown area. Years ago, I worked in a tall office building as a landscape designer, but it had been a long time since I had spent any time there. I was delighted to discover a tall Christmas tree in the center of an ice-skating rink – yes, there is ice-skating in downtown Phoenix. Walking further on, we saw a unique use of umbrellas as art. My younger daughters couldn’t figure out why the umbrellas were hanging upside down, but I quite liked the artistic effect. A row of yellow bell shrubs (Tecoma stans stans) added a welcome splash of lush green and yellow color. While you’ll see them grown as a shrub, here they are pruned into small trees. Underneath is the groundcover yellow dot (Wedelia trilobata). Once inside the Phoenix Symphony Hall, we admired the colorful Christmas trees. It was all quite festive, and my daughters were excited to watch their first ballet performance. My mother and daughter, Gracie. Although Gracie has autism, and many things cause her acute anxiety, she was doing very well as she had always wanted to see The Nutcracker. My sister-in-law, daughters, and me! There is one thing about the performance that I haven’t mentioned yet. My cousin’s daughter is one of the dancers in this ballet. She is a ‘snowflake’ in Act 1, and a ‘wildflower’ in Act 2. This is all I can show you of the stage as photos of the performance aren’t allowed. On our way back to the car, we passed by a striking vertical garden, filled with chuparosa (Justicia californica), octopus agave (Agave vilmoriniana), and yucca. Even though the chuparosa was a bit too overgrown, the overall effect was lovely. My Halloween pumpkins that I filled with birdseed are still creating quite a buzz with the neighborhood birds. We have had Alber’s towhees, curved bill thrashers, finches, Inca doves, and sparrows come for a visit. It’s been a real treat watching them out the kitchen window. The pumpkins will probably have to be thrown out in another week, but it’s been nice to find a way to reuse them. Lastly, we’ve been busy baking cookies for upcoming holiday events as well as to give to friends and neighbors. Snickerdoodles are by far our favorite, and they are so easy to make with ingredients that you probably already have in your pantry. *Please feel free to print it out and start your own annual Snickerdoodle cookie tradition.